in the life that is leaving them. My father asleep in his bed. and drove to the sea. is often a good time of year. into a furnace, into the ground. I wish you long lives. you are dying as always. if the time comes? Dear? her in, she lays in bed next to him. March, the dog escapes into the forest. Black fur a mangy blur against the trees. They call for him all the next day. and your legs and yours tanned and the best thing all year. Please note: Reproduction, including downloading of Henry Darger’s work, is prohibited by copyright laws and international conventions without the express written permission of Artists Rights Society (ARS), New York. inside his socks.) And next we do the trash. Laura Sheahen composed this poem in response to The Devil Dancer’s Daughter, a painting by the Sri Lankan artist Gate Mudaliyar A.C.G.S. Amarasekara (b. 1883 – d. 1983). 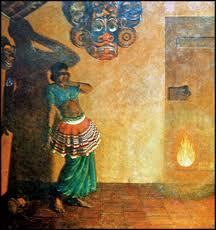 The painting is housed in the National Art Gallery of Sri Lanka and is reproduced here with permission.